Over the course of a 10-week internship, I worked through the entire digital experience design process as a part of 3 main website re-designs. I took on the responsibility of a full-time employee, leading meetings and taking the lead on both research and the Carvel project. My deliverables for each project were user personas and journey maps for Carvel, wireframes for Schlotzsky’s and benchmarks and small tweaks for McAlister’s. I also improved the overall wireframing process and conducted a catering research study. Focus Brands is a traditional franchise-based business that relies on agencies to do most of their digital work in the past. As a result, there was inconsistencies in the websites and a lack of maintenance. I was part of the relatively new tech team, on their first project to re-design all of the existing brand websites. These redesigns had the goal of increasing revenue in franchises through a stronger digital brand. 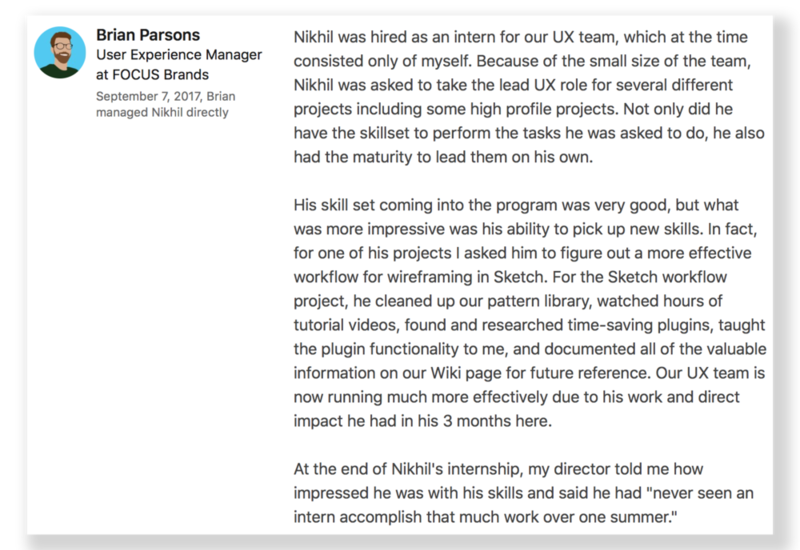 As a part of the UX team, I was involved in every aspect of this process in the context of redesigning several brand websites (except the Release step, led by the development team). Our user base was very open-ended and varied based on which brand we were working with. In general, we were focused on various American fast food restaurant-goers, which included families, and both white and blue collar workers. I was responsible for the Discovery and Research phases of the process. Much of this involved working with the Carvel team to understand how their business was structured and how they measured sales to understand business goals. For example, we discovered that all Carvel grocery products are sold by a company called Rich’s and not by Focus Brands. As a result, we had to reduce the prevalence of references to grocery products that would take sales away from the Focus Brands-run Carvel shops. I mapped out the functions of the business using a business model canvas that could be referenced throughout the design process. We conducted user interviews with Focus employees who fell into the target demographics and explored the process that users took in order to get ice cream, especially when deciding to visit a new place. Combining the context from interviews with analysis of customer complaints of the current website, I developed personas that would serve as a concise reference through the design process. I also mapped user journeys to further understand the way users could interact with our product and all possible contexts in which they could interact with the product. Disclaimer: User Journeys omitted for confidentiality, since product is still in development. For Schlotzsky’s, I mainly focused on developing the wireframes, the primary deliverable for my team. We were told that catering was a big priority financially, so we launched a research study into catering. In between projects, the Moe’s Catering team decided to finance a study into the quality of online catering systems for several of our brands and some of our competitors: Moe’s, Schlotzsky’s, Panera, Chipotle, Domino’s, and Corner Bakery Cafe. The team was looking to see how their current vendor for catering stacked up with the competition. I created tests on Validately for users to order a complex catering order online to gain insights into the use of the entire ordering system. I created an experience map to show where all of the issues manifested for users. The results of the study showed that our systems performed poorly in comparison to the other systems. However, the competitors weren’t much better, indicating that online catering systems were an opportunity for improvement. At the end of the project, I presented my findings to the CIO of Focus Brands to help influence the direction the Digital Engineering team will take going forward and also for use as a leveraging point for negotiating our contract with our catering vendors. This process began with a brainstorming session with the members of the Schlotzsky’s team. From there, I synthesized the output of the brainstorm and built low-fidelity wireframes in Sketch. Certain features that we brainstormed were entirely brand new, explored different design directions for each idea. We ran a variety of tests from paper prototypes to higher fidelity prototypes in InVision, using used the results to inform tweaks into a greater detail. One major flow included a catering calculator for deciding the right amount of food to order. For the McAlister’s website, I was in charge of creating benchmarks for how well users could accomplish basic tasks on the McAlister’s website before the redesign. After the tests were recorded, I watched many user think-aloud studies and identifying the most significant issues apparent on the website. Once the website was live, I conducted an accelerated version of the UX process to address some of the smaller issues apparent on the final website. The main issue we discovered was that newer locations of McAlister’s stores had no place to list career information since they didn’t have their own Store Pages yet. There were a variety of possible solutions to this from a user-perspective, but I was able to come up with a solution that both seemed the most intuitive from the point of view of a user and minimized engineering work. Rather than developing new Career components with all of the application information, I had the team just create basic mailto links that would populate with all necessary information, cutting dev time to a few minutes from the hours a more complex solution would’ve taken. I dedicated some of my time to improving the general workflow for the design and development team. This involved cleaning up the Sketch workflow, detailed in this Medium post. I simplified the base Sketch file that we built all of our wireframes from. When I began my internship, getting the wireframe done for a single page could take hours, but now it can be done within minutes. The user isn’t the only person that matters - Although I had heard this in my design classes, I never really understood who else could matter other than the user. I had to spend a significant amount of time understanding how the business operates to maximize profits while providing a good user experience. Getting to know the capabilities of the engineering team was also key in informing design decisions, since a design is only as good as its implementation. Selling UX to stakeholders doesn’t have to be hard - I knew I was going to have to sell the process to the stakeholders (representatives of each brand), since they didn’t necessarily understand the process. However, simply hosting brainstorming sessions and letting stakeholders sit in on user interviews and tests were enough to demonstrate what value we were providing. Ultimately, the experience was incredibly valuable. I didn’t realize that it was possible to learn so much in a single summer and I’ll always be thankful to Focus Brands for giving me my first opportunity to design professionally.